Making a net to catch fish or sea mammals requires precise measurement of the openings, or mesh. This tool shows the size needed for king salmon, one of the largest fish. It is made of caribou bone with a wrapping of split spruce root around the handle. Today, Yup’ik fishermen use commercial nets rather homemade ones. Virginia Minock: Tangerrlallruunga tamakuneng. Kuvyissuutet. Neva Rivers: Negat tua cuqyutii. Negat cuqyutekluku. Joan Hamilton: Qilag- [to make a fishnet] is “making nets.” It’s a measuring tool for mesh size. John Phillip, Sr.: Kuvyissuutngullilria-w’ tua taryaqvagnek tamana. Aron Crowell: This is from Sabotnisky. Lower Yukon. John Phillip, Sr.: Kuipagmiutaq, ii-i. John Phillip, Sr.: Tuntum irua wallu tulimaq. Iruan tuntum waten ayuquq nalqigtuq. Neva Rivers: Mm-hmm. Makut-llu nemrit-llu makut muragaunganateng cali. Joan Hamilton: Aturpakarluku-llu-qaa waten ayuqliriluni. Neva Rivers: Epua-llu tamana pagutnagaarulluni manigiluni teguqetaanem. Neva Rivers: Cuqait tamalkumeng qilagsuutet ayuqenritut. 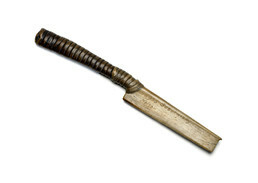 John Phillip, Sr.: My grandma made the tomcod little one [net gauge blade] about this big [one inch]. Neva Rivers: Needlefish-at taugaam makut makuneng atuyuitut. John Phillip, Sr.: All different sizes on that, for [different] fish. Neva Rivers: Can’giirnun atuyuitut makut. Imkunun taugaam naptarnun. Joan Hamilton: Like, different kinds of salmon—chum, dogfish, silver, king. Neva Rivers: Naternitet-llu [and flounder]. Different sizes. Neva Rivers: Nayirrsuutet-llu. Allaneng angturpagneng makuneng. John Phillip, Sr.: I made them by hand, using the hand [to measure the mesh], some of them. Joan Hamilton: And you can also use your hands for measuring. 1. Qilagcuun literally means a “tool for making a fishnet” (Jacobson 1984) and, according to Yup’ik translator Veronica Kaganak, often means “net shuttle.” In this context, it refers to a net gauge. A negaqeggun is a “net gauge, used to keep mesh uniform while making a net,” and a qilakeggun is a “net gauge, implement used to measure the mesh size while making a fishnet” (Jacobson 1984). 2. Needlefish are later referred to as cukilek, which is also translated as “stickleback” (Jacobson 1984). Large nets made of thong were also effective for capturing seals, both in open water during spring and fall and under the sea ice in winter. The size of the mesh is different for each species of fish or sea mammal, since it must be just large enough for the animal’s head. For a net maker, a gauge like this provides a handy way to measure how far apart to tie each knot. (5) However, all such measurements can also be expressed in terms of the human body. (6) For example, the cords of a king salmon net are spaced to equal the distance from the tip of the middle finger to the center of the palm. (7) The blade of this gauge approximates this same distance, taking into account the wide variation in human hand size.